This eagle is very realistic with natural looking colors. It will add prestige and beauty to any flagpole. 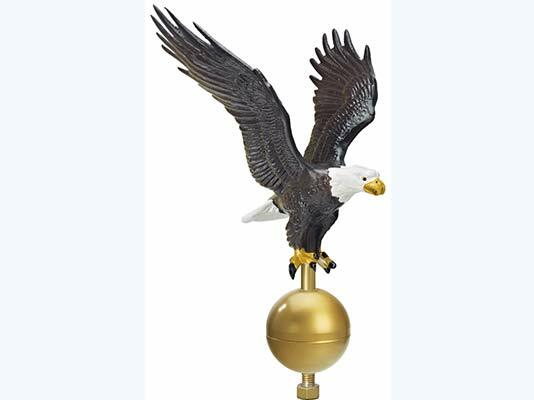 The eagle is made of cast aluminum and sits on a 3'' anodized gold ball. It is recommended for flagpoles 20' or taller. The wingspan is 15'' inches and the threads are a standard 1/2''-13NC. Made in the USA! If you don't see what you are looking for please call us, we can get any parts and accessories for any kind of flagpole. We can also help you to install parts and we repair flagpoles. Call us at 208-890-5246.